After Dental Care, What's Left in Your Wallet? You are here: Home \ Blog \ Destination Medical Care \ After Dental Care, What's Left in Your Wallet? 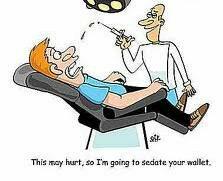 This may hurt a little, so I’m going to sedate your wallet. Have you ever noticed that dental pain often finds its way from your mouth to your wallet? In the United States, major dental care can cost anywhere from a few hundred to more than $40,000. When you turn to your dental insurance policy for benefits, you find coverage limits of only a few thousand dollars, leaving you with a bill that can look like the cost of a new car. Recently, a friend who requires significant dental treatment contacted Soter for help. In her case, the bill in the US for the treatment she needs is more than $40,000. Her dental insurance has a $1,500 annual benefit. We know from experience there are outstanding dental providers in parts of the world; in fact, many of them went to school in the United States and other nations where dental education is excellent. We know the technology and techniques in the best international dental clinics meet domestic standards. In fact, some of the best clinics are more up to date than my local dentist. We know that cost structures are less expensive than in America. What we had to identify was which providers provided the quality result we, and more importantly you, demand. Destination care, whether medical or dental, is about quality. No one, including me, wants to travel to receive substandard care, even if it is less expensive. The question was where to find providers who could meet our hallmark standards: premier quality, access, affordability and service excellence. The answer was that very few sources had good information for dental patients. Once the quality criterion is met, it’s hard to argue with the cost savings, even from premier dental clinics. A procedure that runs $10,000 in the US can cost as little as $2000 in some places. Our friend’s $40,000 procedure will be about $17,000, including travel expenses. She can use her dental insurance and her Health Savings Account to offset some of the expenses too. Destination dental work is not for everyone. It’s not a replacement for a dental cleaning or minor services, since the cost of treatment and airfare will exceed what you would pay at home. But for major treatments, it offers a great option. Thousands of Americans, Canadians, Aussies and Brits are taking advantage of the opportunity. We’d love to hear from you. How large a bill have you faced for dental care? Have you traveled outside your home country for dental treatment? Share your experiences, so others can benefit. Are you ready to keep more of your hard-earned money and try destination dental care? Call us at 855-54SOTER or email info@soterhealth.com for more information or a free quote.